Every Christian claims Jesus as Savior and Lord, so essential questions of how we understand Jesus, his earthly ministry, the meaning of the crucifixion, and the nature of his call upon our lives become the grounds of our essential debate and, literally, a matter of life and death. When we encounter a Christian who thinks and believes differently, we often experience that difference as an attack on the principles upon which we have built our lives and as a betrayal to the faith. These battles are not new—Christians have disagreed since the days of the early church. However, it is possible for Christians to retain their differences and yet unite in respect for each other. It is possible to love one another and at the same time retain our individual beliefs. Christian Civility in an Uncivil World is a collection of essays from across a wide range of theological and political perspectives that demonstrates that we can talk together, listen to each other, change the Christian dialogue, and thus change our world. Mitch Carnell was president and CEO of the Charleston (SC) Speech and Hearing Center for thirty-five years. He is a fellow of the American Speech Language and Hearing Association and was awarded the honors of the South Carolina Association. He was awarded South Carolina’s highest citizenship award, the Order of the Palmetto. He has written for Reflections, the daily devotional guide published by Smyth & Helwys and is the author of Development, Management and Evaluation of the Community Speech and Hearing Center, Speaking in Church Made Simple, and Say Something Nice; Be a Lifter. He wrote a column for fourteen years, “Speaking Frankly,” for Business Review published by the Charleston (SC) Post and Courier. He holds degrees from Mars Hill College, Furman University, the University of Alabama, and Louisiana State University. Carol, his wife, retired as a business education teacher from Charleston County Schools. Mitch Carnell, a member and deacon at Charleston’s historic First Baptist Church, has converted his concern over a lack of civility in church and public life into a book he edited entitled Christian Civility in an Uncivil World. Mitch Carnell, a lay leader at Charleston's historic First Baptist Church, is concerned about a lack of civility in public affairs and church life. His concern has led him to edit an insightful book called "Christian Civility in an Uncivil World." 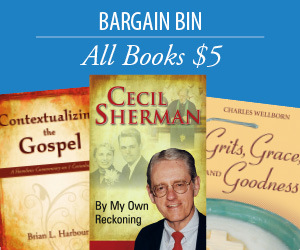 The essays are written by notable church leaders representing various Christian traditions. John Gehring and Alexia Kelley are Roman Catholic laypersons who write about mediating and modulating too much inflammatory rhetoric and negotiating the politics of the church they know and love. The Rev. Sally Dyck, bishop of the United Methodist Church, Minnesota Conference, draws on a distinctive Wesleyan tradition she terms "Holy Conferencing." Dyck outlines an approach to negotiating and problem-solving designed to minimize the unfortunate consequences of a church life reduced to "winners" and "losers." She has adapted this approach from Methodism's founder John Wesley. Another bishop, the Rev. Stacy Sauls of the Episcopal Diocese of Lexington, Ky., who is also an attorney, writes with notable pastoral sensitivity concerning the conflict in the church he loves and serves surrounding the matter of one's sexual orientation. In this essay, Sauls declares, "What We Need is More Maturity." Except I found myself wondering if the notion of being "more mature," however kindly presented, might still provoke anyone conflicted or threatened about such a polarizing subject. Likely the most public of those writing in this book is the Rev. Richard Mouw, a Presbyterian and president of Fuller Theological Seminary. A leading figure among American evangelicals, Mouw's chapter, "Good Manners for Public Christians," is reflective of his firm convictions and kind and considerate spirit, evident when he addresses hot-button issues in the world of religion and culture. Carnell's essay, "The Power of Words," not only reveals how hurtful interpersonal communication can be, it offers thoughtful guidance for improving interpersonal relations through a greater awareness of responsible and considerate ways of speaking and listening, both verbal and nonverbal. Having spent his professional lifetime studying "The Power of Words," its intricacies and subtleties, Carnell's contribution to improved civility for the church in the world is worthy indeed. The chapter contains numerous evocative quotes from both well-known and lesser-known people. One that sparked my imagination was Mark Twain's: "The difference between the right word and the almost right word is like the difference between lightning and the lightning bug." Plus, the theological/biblical foundation Carnell offers is particularly significant for any Christian discussion of "civility." Three representative Baptist ministers also are contributors. Jimmy Allen describes important efforts in "Bringing People of Faith Together," drawing on conflict involving Southern Baptists over several decades. Tom McKibben's "The Minister as Friend" is written from the perspective of someone who has served two different American Baptist congregations in Massachusetts. His is an important contribution to the practice of pastoral theology. Wade Burleson, another Southern Baptist, who has developed quite a reputation as a blogger, writes the essay "Christian Civility on the Internet." 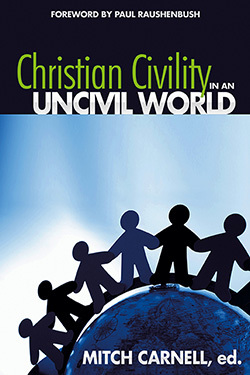 "Christian Civility in an Uncivil World" is a readable book, as conversational as it is intellectually, morally and spiritually stimulating, and sure to appeal to anyone concerned about conflict in and outside of church life. Carnell has joined with an impressive array of thoughtful, faithful church leaders in producing an important book I commend to both clergy and laity.